SUMMARY: The Cervelo P2 is one of the most iconic triathlon bikes of all time. The latest version of the P2 keeps with the Cervelo tradition of building aerodynamic AND practical triathlon frames. The fit is ideal for most athletes racing short or long course. For the dollar the P2 105 is on par with bikes twice its price and a great platform for any triathlete or time trialist. The Frameset: The foundation of all bikes is the frame itself, and the P2 is a benchmark for most other triathlon bikes. The P2 is a full carbon fiber frame with full carbon fork. Cervelo provides riv-nuts on the top tube for a direct-mount bento box. Down tube water bottle mounts exist to address hydration needs. Cable management starts behind the stem, where both derailleur cables tuck away inside the frame, only to exit below the BB. The system is simple, clean, and works smooth. The rear wheel mounts onto horizontal dropouts. This allows you to adjust the rear wheel clearance based on tire size and personal clearance preference. 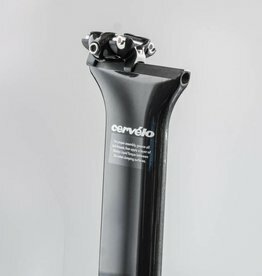 The full carbon proprietary Cervelo seat post mounts to the frame with a single seat post wedge. Use carbon paste and torque to about 8nm and you'll experience no seatpost slippage. 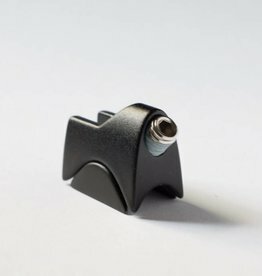 The saddle mount is infinitely adjustable in tilt, providing significant fore-aft adjustability. For 2018 Cervelo has released two new paint schemes for the P2: black wit neon, and navy blue with red. Both colors look amazing in person, we hope our pictures do it justice! The Fit: Cervelo didn't hold back on frame sizes for the P2 or P3: 6 frame sizes in total with a size run from 48cm to 61cm. Compare that to 3 or 4 frame sizes for many other manufacturers. More sizes = more likely a size exist that fits you well. Adding to the "fit-ability" of the bike is the versatile Profile Design T4+ aerobar and tradition stem. 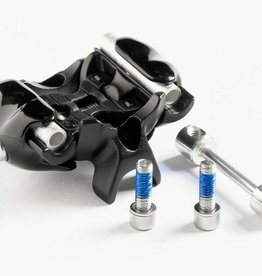 You can add up to 7cm of spacers to the T-series aerobars with the Profile Design riser kit. An ISM PR 1.0 saddle sits atop the seatpost, and is a great spec for any triathlon bike. Components: A good rule if you want a drivetrain to work well is to keep the parts all within the same manufacturing family. In the past Cervelo experimented with brakes and cranks from different companies, but not so in 2018. Shimano takes care of all component duties except for the brake levers (Profile Design ABS brake levers). The Shimano 11 speed 5800 105 drivetrain is reliable and race ready. The only exceptions to the 105 component package is the Shimano RS510 compact crank and Dura Ace 11 speed shifters. In short, these are all parts that don't register high on the flashy scale, but are reliable and will serve you well. One area some bike manufacturers get creative on are the brakes. The most reliable, hassle free option for any triathlon bike is to not hide the brakes from the wind, and use traditional dual pull brakes. Part of the Cervelo P2's bullet-proof reliability has to do with not trying to hide the brakes. Whatever tiny aero penalty exists using tradition brakes is worth the hours of life saved when swapping out wheels. We cannot count how many times we've thanked Cervelo for not hiding the brakes on this bike! If you need to shave a few precious seconds, considering adding one of the many aero brakes on the market that are compatible with this bike. Add-Ons: All triathlon bikes need some accessories. For better or worse, Cervelo has decided to leave the add-ons to third party manufacturers. A direct mount bento box and rear bottle cage mount are two common add-ons. The benefit of not having any proprietary add-ons is that you can pick/choose what works best for you. Areas of Concern: Our single request with this platform are addition water bottle cage mounts on the seat tube. Having the option for a second bottle on the frame would be great. Other than that, the P2 105 is a great triathlon bike that can take you to the finish line of your first sprint tri, or even Kona.